We wouldn’t be able to say our purpose is ‘improving lives for generations’ without thinking about where that next generation of scientists will come from. 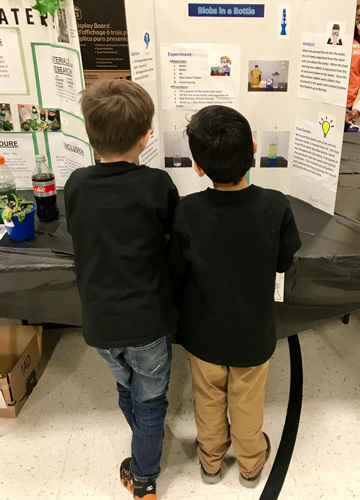 That’s one of the reasons why we support Enders Salk Elementary school in Schaumberg, Illinois, US, and why we were delighted to judge their first ever science fair. Our own scientists volunteered to make up the panel, judging projects from students of all ages. How much salt is in our food? How do different storage conditions affect plant growth? How fast does candy dissolve in different liquids? Are cats left or right ‘handed’? These were just some of the projects presented by the curious young minds at Enders Salk, at an open evening for parents, friends and neighbours on the school campus. Enders Salk’s first ever science fair winner was sixth grade student Giselle, for her investigation on fire-resistant materials and finding the least flammable commonly worn clothing. “Events like this really bring these subjects to life and help foster a lifelong appreciation of Science, Technology, Engineering and Mathematics (STEM) subjects,” said school Principle, Michael Henry. Tate & Lyle’s collaboration with the school is part of a wider partnership, encouraging interests in STEM subjects, delivering events and teaching parts of the curriculum. We also sponsor the school’s breakfast programme. “We were really impressed by the standard of the projects, and how ambitious students were in this, their first science fair,” said Scott Kleespies, Tate & Lyle Research Scientist. Watch the below video to learn more about Tate & Lyle’s work with Enders Salk, or for other local communities click here.